Ulcerative colitis or rheumatoid arthritis are diseases causing chronic inflammation (either in colon or in joints), which (in the long term) stays behind tissue destruction resulting in pathological changes, pain and loss of tissue function. Due to unknown ethiology of both diseases, a selective treatment is highly problematic. The huge rheumatoid arthritis drug market (15 B USD) is dominated by TNF-alpha inhibitor drugs (mainly anti-TNF-alpha antibodies) which are able to help patients but they are expensive and not easy to use. Moreover, in case of ulcerative colitis, there is currently no cure available other than surgically removing affected colon tissue. 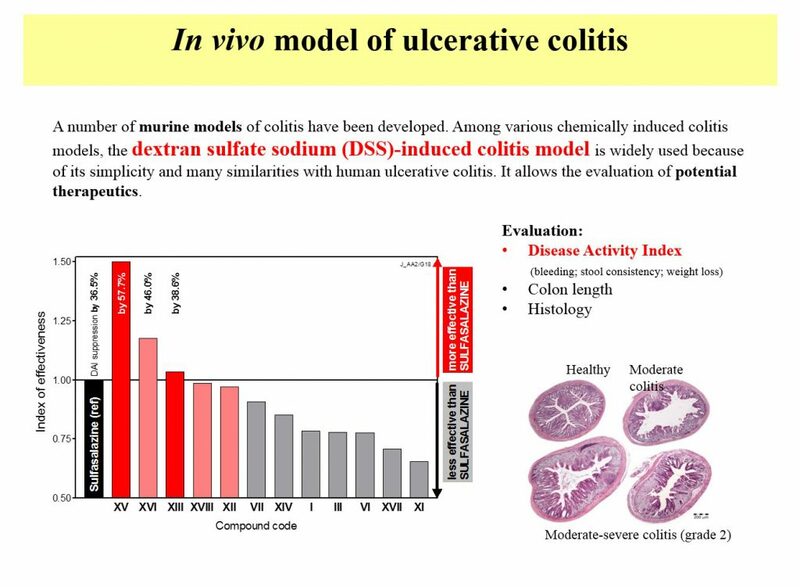 Therefore, effective and non-toxic drugs belonging to group of small molecules are highly needed either in ulcerative colitis or rheumatoid arthritis treatment. Novel pyrimidine derivatives were identified among promising anti-inflammatory drug candidates. A library of novel pyrimidine derivatives has been prepared and tested for inhibition of nitric oxide (NO) and prostaglandin E2 (PGE2) production using potentiated (LPS) mouse peritoneal macrophage model. Selected compounds were tested in animal models of acute or chronic colitis and rat rheumatoid arthritis model. Novel pyrimidine derivatives were proved to inhibit production of NO, PGE2 and pro-inflammatory cytokines on mRNA level, while inhibition of iNOS, COX-1 or COX-2 enzymes was not detected. Significant positive healing effects were observed after p.o. application using animal models of rheumatoid arthritis and ulcerative colitis (acute or chronic). Other obtained results (MTD) showed no toxicity of compounds at doses of 2.000mg/1kg b.w.. Furthermore, results of PK assays confirmed sufficient bioavability and relevant concentration of compounds in blood was observed. Early preclinical stage, in vitro and in vivo testing, toxicology. Optimization of the API synthesis and analytical development proceeds. EP and US patent application with priority date in Feb 2011. Patent has been already granted in the US. Institute of Experimental Medicine AS CR, v. v. i.